The Sankɔfa Journey is truly an life-changing experience. Mawiyah Kambon, PhD and Ọbádélé Kambon, PhD endeavor to provide Afrikans exclusively with a diverse array of activities. Participants will enjoy indigenous fare specialized for health conscious and vegans. The Sankɔfa Journey is a truly healing journey! Participants will get to meet traditional luminaries such as Nana Abena, great great granddaughter of Nana Yaa Asantewaa, Nana Gyamfi, the kentehene of Bonwire, the Nsumankwaahene and chief spiritual consultant to the Asantehene and more! Participants will see breathtaking countrysides and waterfalls to see what Afrika has to offer and so much more! 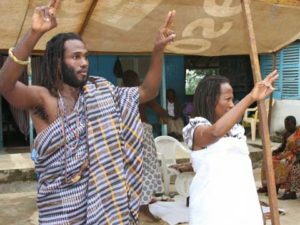 Every participant’s Sankɔfa Journey is an individual experience as well as a collective experience. Many times, participants are the first in their family line to set foot on Afrikan soil in 300 or more years. In this way our Sankɔfa Sojourners represent not only themselves but their Afrikan Ancestors and descendants. Join us on the Sankɔfa Journey and you will never forget and will always treasure this truly enriching experience!